What is Freud’s theory of libido? Throughout his career Freud maintained a theory of libido as the primary motivating force behind all human behavior. In fact, he parted ways with some of his favorite pro-tégées after they proposed competing theories about human motivation. Libido can be loosely translated as the sexual instinct, but really refers to all aspects of sensual pleasure. In Freud’s view, instincts press for release as part of the pleasure principle. Pleasure is only attained when tension is reduced through release of instinctual energy. If the instinct is blocked from release, it will seek another outlet, much like a river running downstream. This mechanistic view of human motivation was called the hydraulic model and reflects the scientific models of the day. Sigmund Freud’s office in London, where he immigrated in 1939. 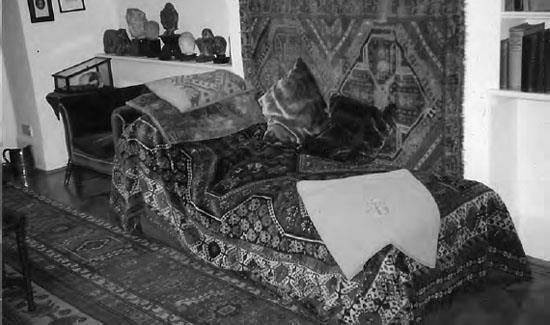 Patients laid down on his famous couch while Freud sat behind them in his chair. (photo by Lisa J. Cohen).